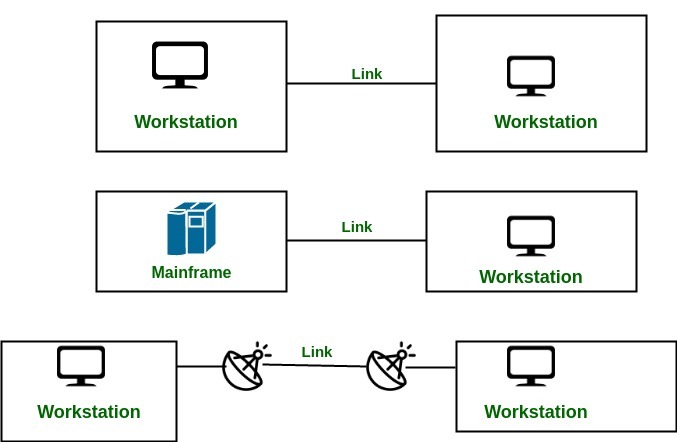 A network is two or more devices connected through a link. A link is a communication pathway that transfer data from one device to another. Devices can be a computer, printer or any other device that is capable to send and receive data. For visualization purpose, imagine any link as a line drawn between two points. A point-to-point connection provides a dedicated link between two devices. The entire capacity of the link is reserved for transmission between those two devices. Most point-to-point connections use a actual length of wire or cable to connect the two end, but other options such as microwave or satellite links are also possible. It is also the simplest to establish and understand. Example: Point-to-Point connection between remote control and Television for changing the channels. It is also called Multidrop configuration. In this connection two or more devices share a single link. Spatial Sharing: If several devices can share the link simultaneously, its called Spatially shared line configuration. Temporal (Time) Sharing: If users must take turns using the link , then its called Temporally shared or Time Shared Line configuration. This article is contributed by Saloni Gupta. If you like GeeksforGeeks and would like to contribute, you can also write an article using contribute.geeksforgeeks.org or mail your article to contribute@geeksforgeeks.org. See your article appearing on the GeeksforGeeks main page and help other Geeks.